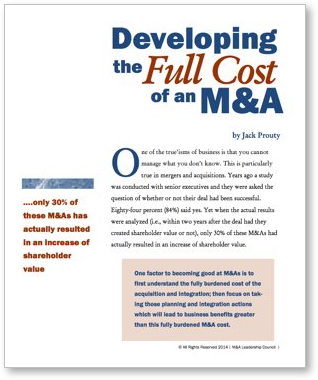 Free Download - "Developing the Full Cost of an M&A"
Enter your name and email address to download this Premium Document, and receive articles, emails & our newsletter sent to your inbox. Do you know how to determine the fully burdened cost of an M&A? Years ago a study was conducted with senior executives and they were asked the question of whether or not their deal had been successful. Eighty-four percent (84%) said yes. Yet when the actual results were analyzed (i.e., within two years after the deal had they created shareholder value or not), only 30% of these M&As had actually resulted in an increase of shareholder value. This free download contains valuable templates and case studies designed to help you capture the true acquisition costs of doing a deal. We'll also send you our monthly "M&A Monthly" newsletter, full of great case studies and advice from global M&A leaders. Just fill in the box and you'll have immediate access to this valuable resource for your M&A efforts.